Unless you refuse to light the room where you write about conspiracy theories with anything but antiquated incandescent bulbs, you really don’t have a single reason not to upgrade to Philips’ new 60-watt equivalent LED bulbs that cost just five bucks without a utility rebate. 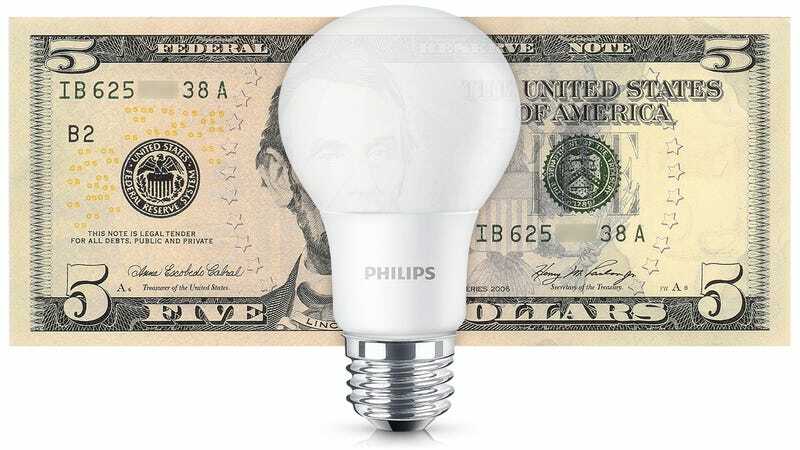 It will officially be the cheapest 60-watt equivalent LED bulb you can buy when available at Home Depot starting in May in both 2700K and 5000K color temperature versions. And thanks to a shatter-resistant design, it should easily survive its 10-year expected lifespan, costing just over a dollar per year to power its 800 lumens output.